I borrowed two pairs of Peter Hardie’s prototype Vitesse Audio interconnects a few months back, and it didn’t take long for me to figure out that I was hearing something special. I kept my peace though, and didn’t make too much of a fuss until I could hear the final production versions, which I was told would be much better than the early versions. These cables must be amongst the most tweaked audio products I’ve yet encountered. Hardie seems to have investigated every possible parameter from the materials to the construction and he’s done it with great patience to unfeasible levels of precision. Even the smallest changes in conductor spacing or dielectric material affect the end result, and it’s taken him a long time to get to these final production-ready versions. 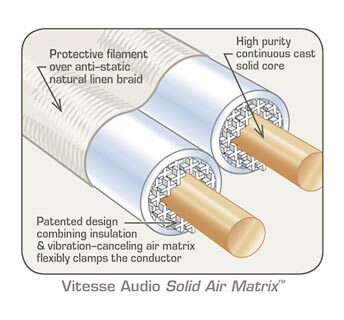 The cables are described as a “Solid Air Matrix” design using a mix of solid core continuous cast single crystal 5N silver (99.999% pure) and 6N copper conductors (99.9999% pure) in an air-sealed vibration damped dielectric. Vibration control is a major part of Hardie’s audio philosophy, so it’s no real shock to find that he’s working at reducing vibration right down to the surface of the conductors in a cable. The design of the cables eliminates microphonics using a combined mechanical isolator/air insulator system, and maintains a consistent parallel geometry for the conductors. All connections are cold-welded and all junctions (plugs and sockets) are de-plated and polished by hand, which of course takes hours and hours of careful labour. The cable is surrounded by a clear filament and a natural linen braid, which is custom woven for Vitesse Audio in Japan. These cables are hand made in good old NZ. The end result is a neat looking, albeit rather plain cable that has obviously been designed around sonic concerns, not bling. You won’t see these cables wrapped in inches of shimmering coloured braid. When I finally got hold of the review set, I started off with the simplest and most efficient (not the quickest and laziest) way of hearing an interconnect cable in all its glory – I ran a 1m set of Vitesse Audio Reference RCA interconnects between a Marantz SA8260 SACD player and a Perreaux SXH2 headphone amp with a set of Sennheiser HD650s on the end of it. High resolution, here I come. I’d first spent some time listening to Massive Attack’s Collected on CD and a Bob Dylan SACD demo disc to get my head into the sound of the setup with my 0.5m cryogenically treated Slinkylinks interconnect. 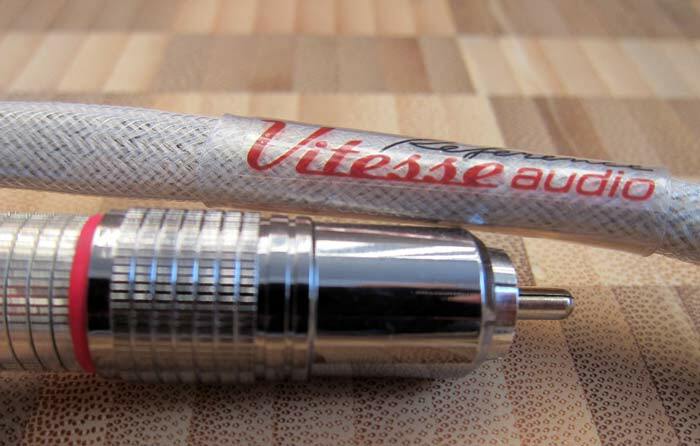 With the Vitesse cable in the loop, I was initially underwhelmed. Something wasn’t right and it sounded as if there was some treble roll-off taking place, which wasn’t what I was expecting. It took a few more minutes of scrolling through the tracks before I realised that the treble had definitely changed, but not by being rolled off. What sounded like less treble was actually more treble. I know, I know, that makes no sense, even coming from me. Allow me to clarify. A layer of glare and hash had been removed from the top end and what I was initially missing was what I was misperceiving as treble energy. It’s not treble energy, just treble harshness. Please allow me to clarify further. This headphone setup sounds fabulous as it is, it’s a seriously revealing combination that gets me fired up every time I hear it, and the cryo-treated Slinkylinks interconnects have had to fight off the many other cables I’ve brought home to review. They’ve stayed with me for the past three years and I’ve been happy. With the Vitesse cable however, the headphone rig was dramatically improved. There was a sensation of hearing more detail, not just in the top end but also through the rest of the frequency range. The sonics were smoother and more natural with increased depth, air and space around everything, and it sounded very much as if the noise floor had been lowered somewhat. How bizarre. Moving two of the 1m interconnects into my main system along with the speaker cables (Neutrik terminated for my amps), I again had the same instantaneous feeling that something was wrong, that someone had soldered an extra resistor into the speaker’s crossover to pull back the treble. Then the same understanding dawned; once again the appearance of less turned out to be more and as I listened, it occurred to me that I’d never heard my Theophany M5s sound quite this good. Smoother yet more detailed, again with more air around every instrument, more of the fire breathing attack that I appreciate so much. It’s definitely not just the top end that benefits though, although that is the most obvious change, but the mids and bottom end get a sonic lift as well.